Liverpool boss Jurgen Klopp says he regrets telling Reds fans without tickets to travel to Basel for their Europa League final. Liverpool have been allocated only 10,236 tickets for the 18 May final against holders Sevilla in Switzerland. Klopp said: "Last time I spoke about Basel, I spoke like a supporter and I invited all Liverpool fans to Basel. "That was not too smart, to be honest. Basel is a nice city but it is not ready for us and it was my mistake." Uefa was forced to defend its decision to stage the final at St Jakob-Park, which has a capacity of 35,000. Liverpool may receive a small number of extra tickets should Sevilla not sell their full allocation, but thousands of their supporters are still set to be disappointed. 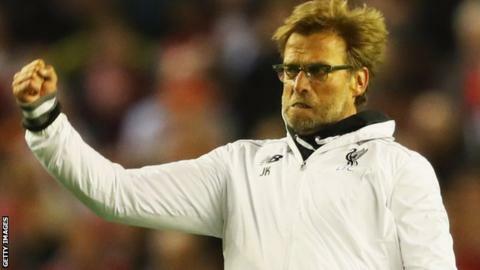 Klopp, who made his initial suggestion the day after Liverpool had beaten Villarreal at Anfield to reach the final, added: "Please only people with tickets go there because everything else will be chaos and we don't want this. "We have to concentrate on football. It is wonderful to be in the stadium but if you cannot be there then stay at home or come to Liverpool and watch the game together with friends and let's have a party after this. "It is really, really, really necessary that you now listen. Most of the time you can ignore what I say but now it is important."